Tacoma Washington is a true hidden gem. It has a rich history and quite the comeback story. There are fun, fresh, new restaurants popping up constantly, but also the common staples we all crave from time to time. Whether you enjoy kayaking, beach combing, or taking a leisurely stroll Tacoma will fit your needs. With 6+ districts all with a different community feel you will find the right oasis for you. The Link Lite Rail runs in downtown Tacoma and is completely free. The Sounder Train stops in Tacoma which makes commuting to Seattle easy as pie. There is an Amtrak station in Tacoma which can take you to Portland for the weekend or a week getaway to Vancouver BC. The bus system will take you all over town, you may never need to drive again! 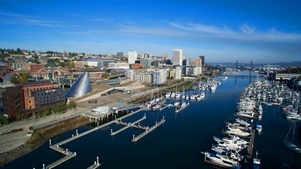 Tacoma has two major hospitals right in it's core. You don't have to stress about good healthcare here, because we've got it! Jan 35.1 F° 41.0 F° 46.9 F° 5.4 "
Feb 36.4 F° 43.4 F° 50.3 F° 4.4 "
Mar 38.7 F° 46.6 F° 54.6 F° 4.2 "
Apr 42.0 F° 51.1 F° 60.2 F° 2.9 "
Jun 51.5 F° 61.3 F° 71.0 F° 1.6 "
Jul 55.0 F° 65.5 F° 76.1 F° 0.9 "
Aug 54.8 F° 65.7 F° 76.6 F° 0.8 "
Sep 50.7 F° 61.0 F° 71.3 F° 1.4 "
Oct 44.7 F° 53.0 F° 61.4 F° 3.4 "
Nov 39.6 F° 45.9 F° 52.2 F° 6.1 "
Dec 35.4 F° 41.0 F° 46.6 F° 5.9 "